The fertilizer industry has been showing signs of stability of late, courtesy of improving pricing and demand dynamics for major crop nutrients. Strong usage in major consumer markets including India and Brazil is driving demand for primary crop nutrients. Healthy global demand along with reduced supply, especially from China, is providing support to global prices of nitrogen, a major crop input. Lower natural gas costs are also acting in favor of nitrogen fertilizer makers in North America, providing support to their margins. Moreover, prices of phosphate and potash have gained strength this year on the back of strong global demand. However, the fertilizer industry is still not out of the woods yet as weak agricultural commodity prices remain a roadblock in the foreseeable future. Sustained pressure on crop commodity prices is hindering a meaningful recovery of the industry. Prices of major crops (such as corn and soybeans) are at multi-year lows owing to a supply glut. Adding to the concerns is the expected decline in U.S. farm income in 2018. The U.S. farm profits are expected to decline this year, per the U.S. Department of Agriculture’s (USDA) recent outlook. The USDA envisions net U.S. farm income to tumble 13% year over year to $65.7 billion in 2018. Net cash farm income is also forecast to decline 12% to $91.5 billion. The projected decline in farm profit is mainly due to an increase in production expenses. As such, lower anticipated farm income is likely to negatively influence farmers’ nutrient-purchasing decisions. Moreover, concerns over escalating trade tussle between the United States and China are weighing on crop prices in North America. China, in July, imposed tariffs on $34 billion worth of U.S. goods, including agriculture products. China is also planning to levy tariffs on a further $60 billion of U.S. products (including a wide range of agricultural products) after the U.S. government threatened to slap a 25% tariff on $200 billion worth of Chinese imports. As such, downward pressure on agriculture commodity prices is likely to continue over the near term amid trade tensions. Weakness in crop prices and the prevailing trade tensions are also likely to make farmers cautious in their fertilizer buying decisions over the short haul. The Zacks Fertilizers industry currently comprises seven stocks and it is grouped within the broader Zacks Basic Materials Sector. The industry has outperformed the S&P 500 and its own sector over the past year. 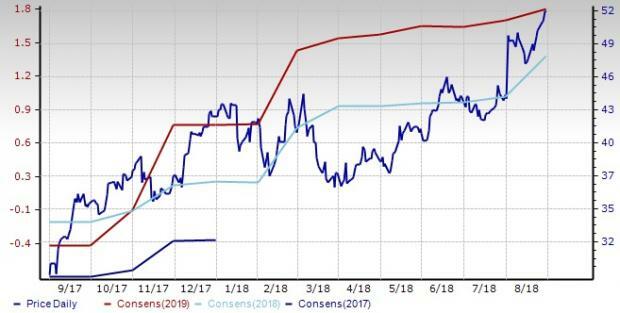 While the stocks in this industry have collectively rallied 31.9%, the Zacks S&P 500 Composite and Zacks Basic Materials Sector have gained 18.2% and 4.1%, respectively. The outperformance has been partly driven by improved fundamentals in the fertilizer industry driven by favorable demand and pricing dynamics for key crop nutrients and healthy demand environment in important markets, including Brazil and India. Given the impressive performance of the industry in the past year, the current valuation doesn’t look cheap. One might get a good sense of the fertilizer industry’s relative valuation by looking at its EV/EBITDA (Enterprise Value/ Earnings before Interest Tax Depreciation and Amortization) ratio. The EV/EBITDA multiple is a preferred valuation metric for cyclical industries like fertilizer that have significant fluctuations in earnings from one quarter to the next. Going by this multiple, valuation for the Zacks Fertilizers industry does not look cheap at the moment compared with the broader market and its own sector. The industry has a trailing 12-month EV/EBITDA ratio of 13.9, which is lower than its own average of 17.2 and the highest level of 20.7 in the past year. 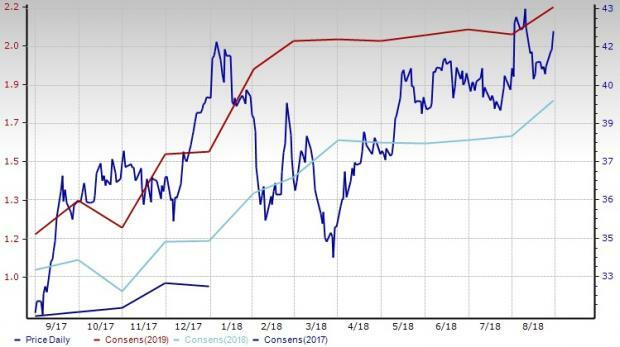 However, the industry compares unfavorably with the market at large, as the trailing 12-month EV/EBITDA ratio for the S&P 500 is at 11.8 and the median level is 11.5. Moreover, a comparison of the group’s EV/EBITDA ratio with that of its broader sector indicates that the group is not trading at a discount. Zacks Basic Materials Sector’s trailing 12-month EV/EBITDA ratio of 8.1 and the median level of 10.2 for the same period are below the respective ratios of the Zacks Fertilizers industry. 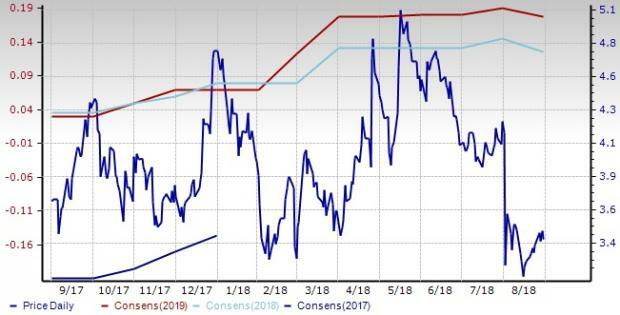 Fertilizer stocks are expected to continue delivering positive returns over the near term on the back of healthy demand and pricing fundamentals for nutrients. But what really matters to investors is whether this group has the potential to perform better than the broader market in the quarters ahead. One reliable measure that can help investors understand the industry’s prospects of a solid price performance going forward is its earnings outlook. Empirical research shows that earnings outlook for the industry, a reflection of the earnings revisions trend for the constituent companies, has a direct bearing on its stock market performance. While one can get a good understanding of a company’s earnings outlook by comparing the consensus earnings expectation for the current financial year with previous year’s reported number, an effective measure could be the magnitude and direction of the recent change in earnings estimates. 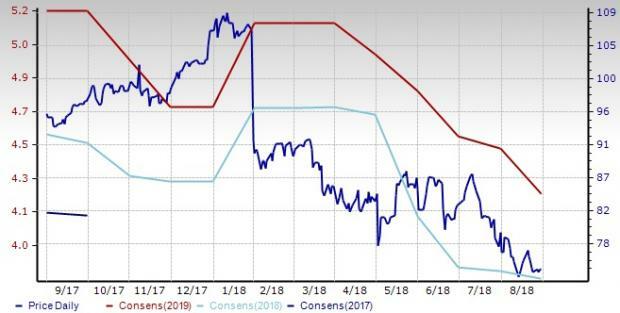 The Price & Consensus chart for the industry shows the market’s evolving bottom-up earnings expectations for the industry and the industry’s aggregate stock market performance. 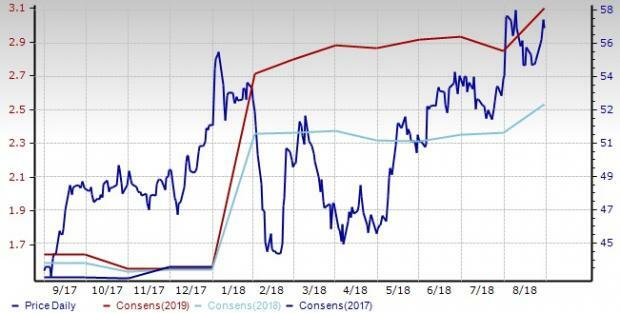 The red line in the chart represents the Zacks measure of consensus earnings expectations for 2019, while the light blue line represents the same for 2018. This becomes clearer by focusing on the aggregate bottom-up EPS revisions trend. The chart below shows the evolution of aggregate consensus expectations for 2018. Please note that the $1.78 EPS estimate for the industry for 2018 is not the actual bottom-up dollar estimate for every company within the Zacks Fertilizers industry but rather an illustrative aggregate number created by our proprietary analytics model. The key factor to keep in mind is not the industry’s earnings per share for 2018 but how this estimate has evolved recently. As you can see here, the EPS estimate for 2018 is up from $1.62 at the end of July, $1.60 at the end of June and $1.02 a year ago. In other words, the sell-side analysts covering the companies in the Zacks Fertilizers industry have been steadily raising their estimates. The group’s Zacks Industry Rank, which is basically the average of the Zacks Rank of all the member stocks, paints a pessimistic picture for the near term. The Zacks Fertilizers industry currently carries a Zacks Industry Rank #179, which places it at the bottom 30% of more than 250 Zacks industries. Our back-testing results show that the top 50% of the Zacks ranked industries outperforms the bottom 50% by a factor of more than 2 to 1. Revenues for the industry have shown an improvement since the beginning of 2018. An improving pricing and demand fundamentals for nutrients have contributed to top-line growth. Fertilizers makers are witnessing improving demand and pricing environment for crop nutrients. However, weak agricultural commodity prices are a concern. In fact, the downbeat view for U.S. farm profits by USDA raises concern for the industry in the near term. Escalating trade tensions between the United States and China are also likely to put further pressure on crop commodity prices. The Scotts Miracle-Gro Company (SMG): This Marysville, OH-based company currently carries a Zacks Rank #5 (Strong Sell). The stock has lost 21.4% in the past year. The Zacks Consensus Estimate for current-year EPS has also been revised downward roughly 1% over the last 30 days. Intrepid Potash, Inc. (IPI): This Denver, CO-based company carries a Zacks Rank #4 (Sell). The stock has lost 8.6% in the past year. The Zacks Consensus Estimate for current-year EPS has been revised 13.3% downward over the last 30 days. However, investors may consider holding onto the following two stocks which have been seeing positive earnings estimate revision. The stocks carry a Zacks Rank #3 (Hold). You can see the complete list of today’s Zacks #1 Rank (Strong Buy) stocks here. CF Industries Holdings, Inc. (CF): The Zacks Consensus Estimate for current-year EPS has been revised 18.1% upward over the last 30 days. The stock has rallied 73.3% in a year’s time. Nutrien Ltd. (NTR): The Zacks Consensus Estimate for current-year EPS has been revised 4.5% upward over the last 30 days. The stock has gained 29.7% in the past year.